Canary Wharf - Corporate River View Apartments in London is an apartment building. Situated within 1.6 km of O2 Arena and 2.8 km of Greenwich in London, Canary Wharf - Corporate River View Apartments provides accommodation with a terrace and flat-screen TV. Free WiFi is provided in all apartments. All apartments have a kitchen with a dishwasher and oven, a private bathroom and a terrace with views of the river. The property is a 5-minute walk from Canary Wharf underground station. Greenwich Park is 3.3 km from the apartment. The nearest airport is London City Airport, 5 km fro...m the property. Situated within 1.6 km of O2 Arena and 2.8 km of Greenwich in London, Canary Wharf - Corporate River View Apartments provides accommodation with a ter...race and flat-screen TV. Free WiFi is provided in all apartments. All apartments have a kitchen with a dishwasher and oven, a private bathroom and a terrace with views of the river. The property is a 5-minute walk from Canary Wharf underground station. Greenwich Park is 3.3 km from the apartment. The nearest airport is London City Airport, 5 km from the property. 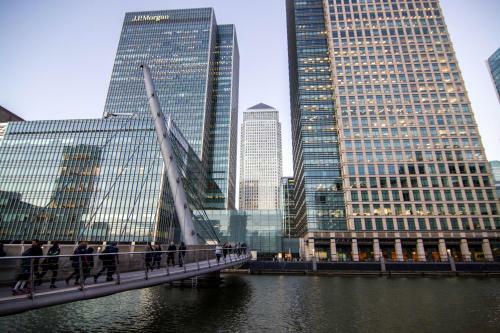 When would you like to stay at Canary Wharf - Corporate River View Apartments? A damage deposit of GBP 300 is required on arrival. This will be collected by credit card. You should be reimbursed within 7 days of check-out. Your deposit will be refunded in full via credit card, subject to an inspection of the property. Please inform Canary Wharf - Corporate River View Apartments in advance of your expected arrival time. You can use the Special Requests box when booking, or contact the property directly with the contact details provided in your confirmation. Guests are required to show a photo identification and credit card upon check-in. Please note that all Special Requests are subject to availability and additional charges may apply. Parking is subject to availability due to limited spaces. This property will not accommodate hen, stag or similar parties. Please note that the property has no front desk and guests must contact the property in advance to arrange a check-in time. Check-in after 19:00 is possible for an additional fee, subject to availability and by prior arrangement. Between 19:00 - 21:00: GBP 30 Between 21:00 - 00:00 GBP 50 Between 00:00 - 01:00 GBP 70 Please note, check-in closes at 01:00 and it is not possible to check-in after this time. If you expect to be late or need to reschedule the arrival time, the property requires a minimum of 1 hour notice. For no-shows or late arrivals of 15 minutes or later past the scheduled check-in time, guests will have to rearrange another check-in time with the property. The rescheduling will be at the most convenient time for the property. Kindly note the property only accepts credit or debit card, and cannot take payments by cash. Please note that this property cannot accommodate stag or hen parties. Parties are also not accepted under any circumstances. The accommodation will charge at least GBP 300 breakage and incidentals deposit at the check-in. The deposit needs to be paid with the same card used to make the booking. This is returned in the next 7 working days after your departure. In some cases arrivals can be charged up to GBP 2000 refundable damage deposit for security reasons. In case of a third party booking, the property request a signed declaration by the cardholder with a copy of ID and credit card used for the booking, in order to authorise another person to check-in on their behalf.